Order Now and Save Big!!! Ask about our "Down Payment Plan"
Lay-A-Way with 50% Down - Interest FREE! The PLOTMASTER’s ™ patented design allows you to disc, plow, plant, cover and cultipack all at the same time, thus saving you an enormous amount of time, money and effort. PLOTMASTER ™ currently offers a variety of models, including small ATV-sized implements up to large tractor-sized implements. Whether you want to plant a small ¼-acre harvest food plot or a large 20- acre management food plot, we have the right food plot equipment and planting machines to meet your needs. 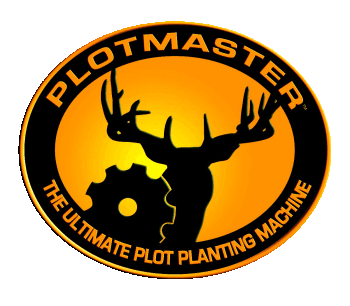 With the PLOTMASTER ™, you are no longer limited to when, where and how you plant wildlife food plots.